On first blush, mixing alcohol with art may seem like a dangerous endeavour. Yet when you think of any gallery launch or vernissage there is always bubbly and wine on hand to celebrate the new works of an up-and-coming darling of the art world. 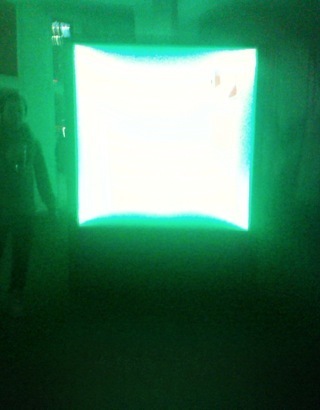 Have you ever been to an exhibition launch where the guests were drinking aloe vera juice. Or Fanta ? So it only seems fitting that one of Germany’s (and the world’s) most popular and beloved beer brands enters the Kunstmarkt. Beck’s recently established The Green Box Project, “a global fund established to inspire, celebrate and financially support independent talent in art, design, music and fashion.” Over the next three years, Beck’s will fund and showcase 1,000 projects by individual artists, musicians and digital designers. It is a fairly heavy brief and the project has already launched in New York and London. It made its Berlin debut last Wednesday 7th at Soho House. I was quite skeptical about this collaboration. Corporate involvement in the arts does not always have a positive outcome in Berlin. A case in point is the recent controversy caused by the BMW Guggenheim Lab. Local residents of Kastanienallee Prenzlauerberg objected to the installation in their street and lobbied the Government and Local council and succeeded in foiling the project. It has since had to change its location to the Pfefferberg down the road. The Green Box launch party was held at SoHo house and as expected, there was a sea of Beck’s bottles and in true Mitte style, woollen beanies aplenty, garlanding the room. There were also a group of people holding their iPads towards a green screen and it was only about half an hour later that I realised that this was the purpose of the green box. 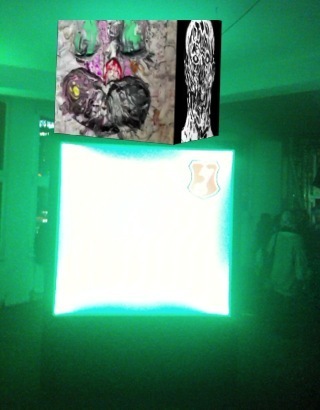 The commissioned art was ‘inside’ and it was supposed to be experienced via augmented-reality. I had to download the special app, then install it on my iPhone using the special Becks wi-fi available on that night only and then enter my date of birth, to ensure I’m not a minor (in Germany, 16 year olds are allowed to legally drink beer anyways). Then it was a matter of pointing the iPad or iPhone to the green ‘box’ and images of the art would appear and could be viewed through the iPhone or iPad. As there was no actual art adorning the walls, the several strategically placed fridges full of Beck’s waiting for the desperate to help themselves, the pulsing green neon lighting and otherwise sparse decoration (white sheets draping carelessly behind the bar) made the function seem as though it could be someone’s private cellar and not necessarily an art event. Which is perhaps what Beck’s was aiming for. On reflection, Beck’s makes beer not absinthe or tobacco and is not involved in oil drilling. It values innovation, being one of the first German companies to use green glass to protect their beer once it had fermented. Beck’s in comparison with other food or beverage businesses, has the kudos to sustain this project. Its prior Art Label initiative sponsored artists such as Tracey Emin, Damien Hirst and Jeff Koons, helping to launch them into stardom. Who knows if Jeff Koons drinks Beck’s. Even if he does not, he is a genius and it will be interesting to observe this new direction in art and the future stars it produces. 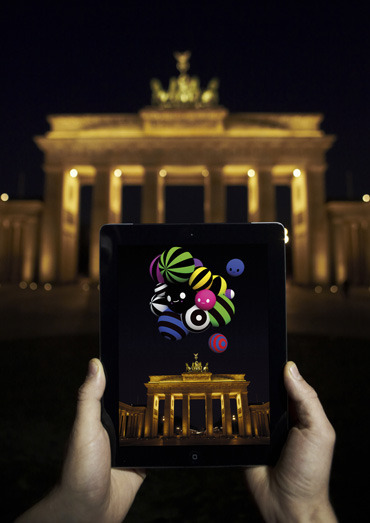 NB: As part of The Green Box Project Berlin launch, the limited edition FriendsWithYou virtual artwork is live until 2nd January and can be viewed by standing approximately 75 meters in front of the Brandenburg Gate using the Beck’s Key app, available at the iTunes & Android store.